Slightly less impressive than Garruk is Mindshrieker, an alright rare. 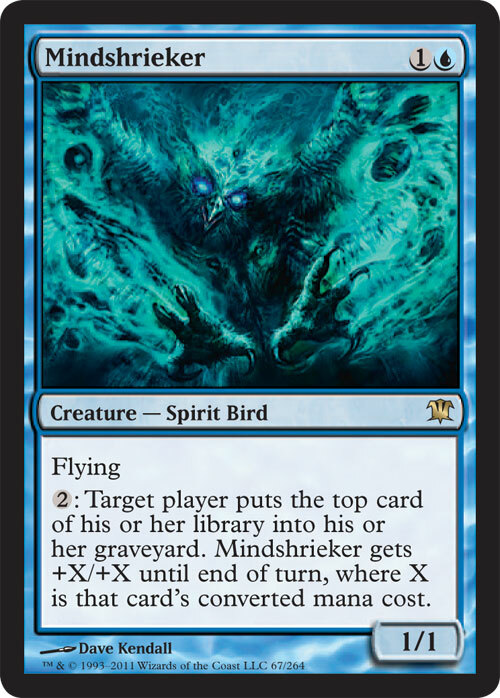 1U for a 1/1 flyer, it’s ability actually isn’t bad; 2 for target player puts the top card of his or her library into his or her graveyard, and then Mindshrieker gets +X/+X, where X is the milled card’s converted mana cost. I like this guy, honestly. Seeing as 2 isn’t bad for 1 mill without a tap, hitting enough decent cards could make this flyer quite a threat in sealed or draft. We haven’t seen much of spirits out of the set so far; nothing decent, at least. However, this card’s returning of spirits from your graveyard is mandatory, so don’t use it with Dearly Departed. However, a 4/4 for 4W that returns spirits isn’t bad, but it depends on what other spirits are released in Innistrad.